I won’t lie, this recipe takes some forethought, as it needs to set in the fridge overnight. But it is a really tasty and impressive dish to take along to a summer party or potluck, and is actually really simple to make. You just need to plan ahead. You can slice it quite thin to serve on a meat and cheese platter, or you can slice it thick to eat as a main dish. 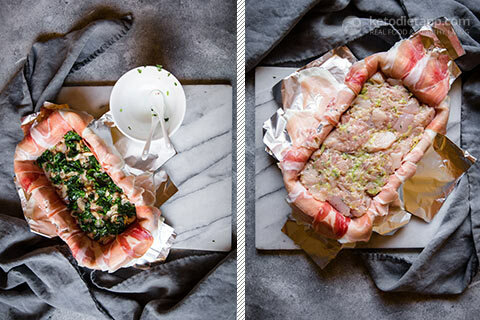 The layer of mushroom and spinach in the middle allows for a pretty pattern and you could add more if you wanted to without upping your carbs too much, just be careful not to go overboard as it can affect the “binding” nature of the chicken. I’m sure that the herbs and middle layer could be switched around to your personal taste, just keep an eye on any carb-creep. Serve with a bowl of dressed greens and sliced vegetables such as radishes, cucumber, red onion, tomatoes and peppers. Place half of the chicken thighs into a food processor and blend until minced. 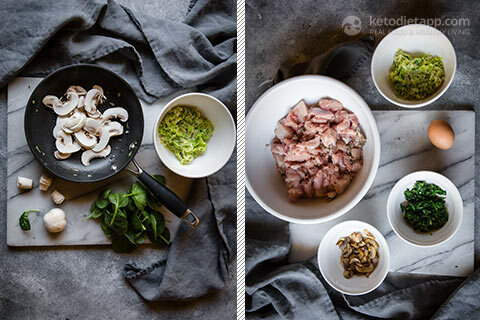 Cut the remaining chicken thighs into 1cm / 1/2 inch cubes. 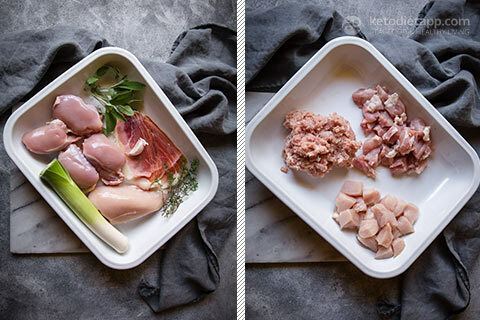 Cut the chicken breasts into 1 cm / 1/2 inch cubes. Place chicken in a large mixing bowl and combine well. 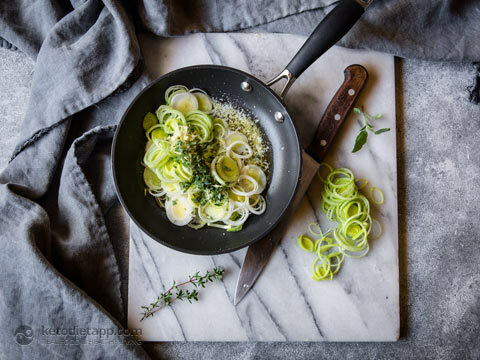 Melt butter in small frypan and add leeks, garlic and herbs. Cook until softened and then put leek mixture aside in a bowl to cool. Place mushrooms into frypan and cook until nicely browned (you may need to add a touch of olive oil or ghee). Once browned, place in bowl to cool. Wilt spinach in same frypan and place aside to cool. Add the leek mixture and the egg to the chicken and mix well. Season with salt and pepper. Meanwhile, heat oven to 180 °C/ 355 °F. 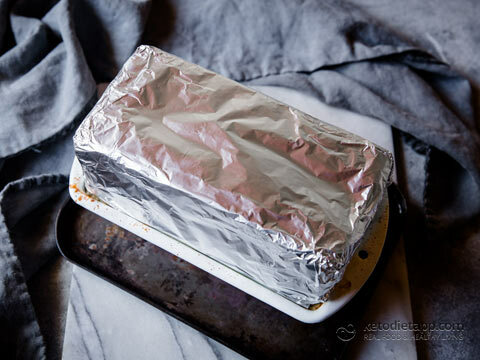 Line your loaf tin with foil, leaving plenty of overhang (I like to add one long folded piece at the bottom to use as a “handle” when it comes time to lift the terrine out). 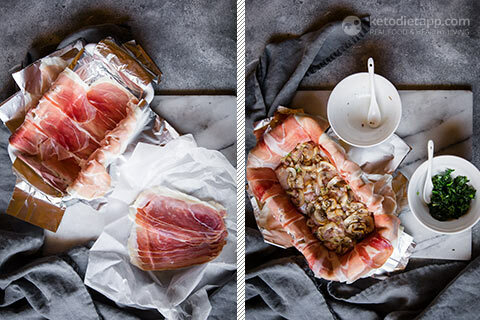 Lay the prosciutto slices in the loaf tin, leaving some edges overhanging. ... and spinach over the top. Add the rest of the chicken mixture and press down well. 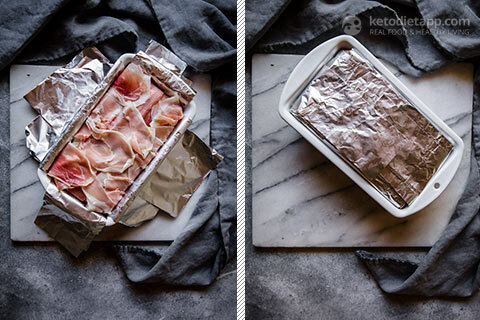 Slowly fold the prosciutto over the top of the chicken, followed by the foil. Bake in the oven for 1 hour. When cooked, remove from the oven and place in the sink. Using another loaf tin, press down hard on top of the terrine to release any juices. Place a weight on top of the terrine (I used a foil wrapped brick but you can place two cans of tomatoes etc. into a loaf tin on top). 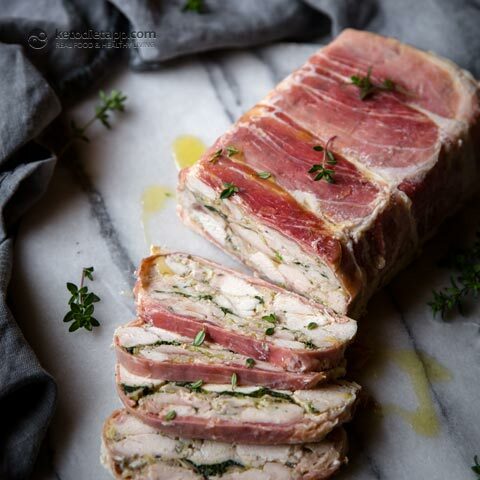 Sit terrine tin on a shallow tray and place in the refrigerator with the weight on top overnight. 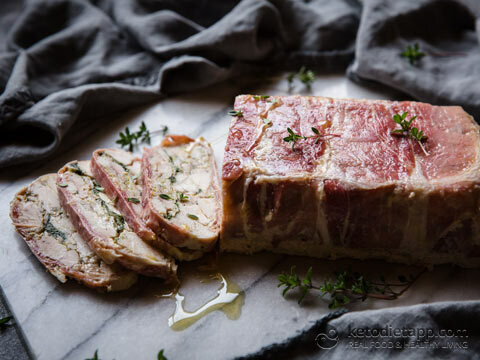 When ready, remove the terrine from its tin and carefully remove the foil. There will be an aspic-like gel around the terrine, you can wipe this away with a damp paper towel. 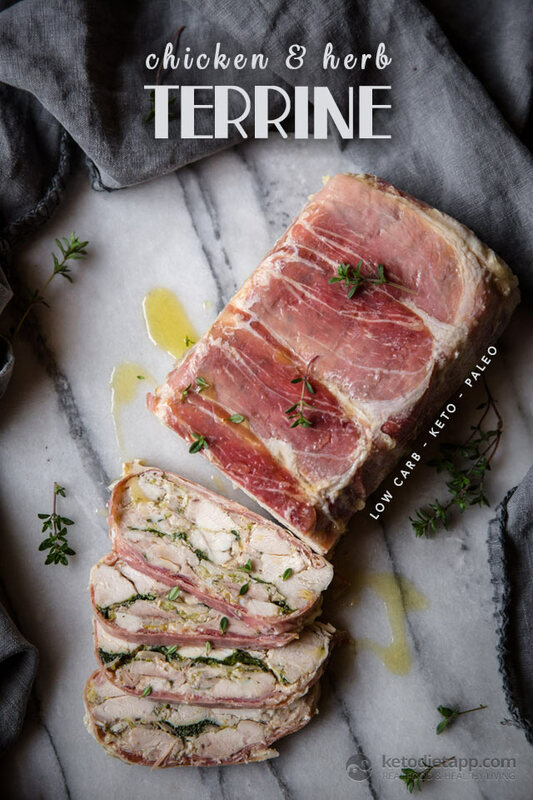 Slice the terrine and enjoy cold. Serve drizzled with extra virgin olive oil and a bowl dressed greens or sliced low-carb vegetables. Store in the fridge for up to 4 days. Thank you Lauren, I hope you like it! Have you ever tried this warm, looks so good! I think it it better chilled - I assume it won't hold its shape when heated. What size/depth should the loaf pan be?